Join our praying Pattern there. Power like thee, our Lord to live. Though the story is not over, many people unfortunately quit reading at verse 36. Stopping there truncates more than the transfiguration story, it truncates the rhythm of discipleship: worship and work, time alone and time together, time in the temple and time in the streets, time in prayer and prayer in action. Verse 37 begins with a mouthful: On the next day. The next day. 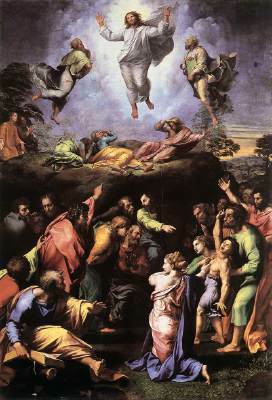 There is a day after the transfiguration. It is the second side of the Transfiguration coin. How much of the life of discipleship happens the next day? The day after Sunday? The day after prayer group meeting … after Bible Study … after morning devotions … after spiritual retreat? We may all share Peter’s impulse to stay on the mountain with Jesus forever. We may even want to build some dwellings there to prolong the visit indefinitely – but that would get the story wrong and render our faith futile. We need the mountain visions where we glimpse the beauty and glory of Jesus, but such experiences should only sharpen our spiritual awareness of God’s mission and ministry for the next day. This week the season of Lent begins with Ash Wednesday. This Lenten season, I invite you to experience the holy rhythm of transfiguration: prayer and action. Consider some of the means of grace that might include fasting and/or abstinence from other things that you hold dear. But don’t just give something up, take something on. Commit to doing good, to serving the poor, to visiting the sick … to some concrete action each week that seeks to give witness to the glimpses of glory and hope that God has placed within you. Dance a little this Lent– and find the holy rhythm of transfiguration. Am I pastor of the wrong church?